I’VE HAD psoriasis since I was nine years old, but it wasn’t until I was in my 30s that I actually did anything about it. I’m 55 now, so you could say I have been dealing with this for most of my life. The stigma is still there. When the skin condition first appeared I was basically told it was just a skin problem and that I had to live with it. I have a particularly severe case of psoriasis. I have been treated with all sorts of creams and ointments, UVB light therapy and I now inject myself with a relatively new treatment that has only been developed in the last few years. I have actually been hospitalised with it a few times. I lived abroad for many years, and it was while I was in Holland and hospitalised for the third time that I realised how serious my skin problem was. In Ireland at the time, the condition was not taken all that seriously. The majority of people with it would just go to their GP and get a cream. There was little support out there for those suffering with the condition. Psoriasis is caused by skin cells shedding faster than they should, about every four days. It is not contagious and is thought to be genetic. For some time there has been an ignorance surrounding it. Many people stare when they see you, and children can be curious. I am constantly asked by them if I burnt myself. What people who don’t have it might not know is that it does have an impact on your life. I have never owned a knee length dress and I never wear dark clothes. Short sleeves are just not an option for me either. I can’t even try on clothes in a changing room for fear of my skin scales flaking off. It can have a very real impact on your mental health. While I never let it hold me back, it can prevent some people from living to their full potential. I have spoken to those who have said they never learnt how to swim because of it, as they don’t want to be seen in a bathing suit. Some men have told me they have quit playing football as they don’t want to get changed in front of their mates. And if you are a young person, you can only imagine what it can be like in school. It is difficult enough to be a normal teenager, without having psoriasis. The World Health Organisation has now recognised psoriasis as a chronic illness. 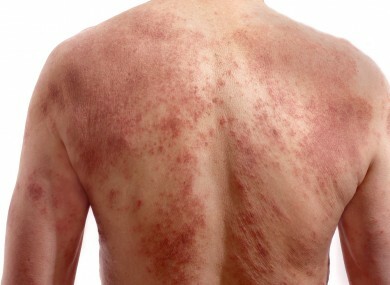 It states that psoriasis is a “chronic, non-communicable, painful, disfiguring, and disabling disease with no cure”. It is now known that people with psoriasis have a higher probability of having type 2 diabetes, obesity and heart disease. It can no longer be treated as a mild disease. Having seen some great support groups in England, I decided to set up a support group in Kilkenny and this eventually led to the formation of the Psoriasis Association of Ireland. This has been an eye-opener for me as I have learned so much more about myself and my skin. I began to realise that it was not just a skin disease which could be covered up and ignored. One piece of advice I can give people is to visit a dermatologist. I sought help from a dermatologist when I returned to Ireland. I always say, if you had a brain tumour you would go to a specialist, so if you have skin disease, you really should be paying a visit to a skin specialist. The problem is, however, there is a shortage of dermatologists around the country. I myself have to drive to Tallaght, and many others from the midlands have to drive long distances for their appointments. In many cases, psoriasis is mild and can be treated very successfully by GPs, but if ignored and not treated it can become very serious. My message to anyone out there is to get it diagnosed properly. Follow the advice you are given and get help and support from fellow sufferers. Caroline Irwin has suffered from psoriasis for more than 40 years. She is the founder of the Psoriasis Association of Ireland and lives in north Kilkenny. Today marks World Psoriasis Day. The #SaySomething campaign and advocacy for improved services has been launched by the Irish Skin Foundation. You can find out more information here. Email “'Living with psoriasis isn't easy. I never wear dark clothes and short sleeves are just not an option'”. Feedback on “'Living with psoriasis isn't easy. I never wear dark clothes and short sleeves are just not an option'”.